Any high school drumline. All members of the drumline must be in compliance with all U.I.L. and H.B. 72 extracurricular activity and eligibility rules. Make your check payable to “Marcus High School Band”; indicate “Lone Star Classic” in the memo/comment area. Indicate clearly on the check your group’s school name or soloist’s name. Entry Deadline is October 15th. Late entries, please email chair@lonestarclassic-dlc.com for availability. Late registration fee is $225. Entries are not considered official until paid in full. Drumlines not paid prior to October 15th may lose priority performance slots and may be subject to late registration fee. The Lone Star Classic Committee and Tournament Director reserve the right to make adjustments to the segmentation to maintain even contest groupings. Notification to the appropriate directors will be given prior to the contest. 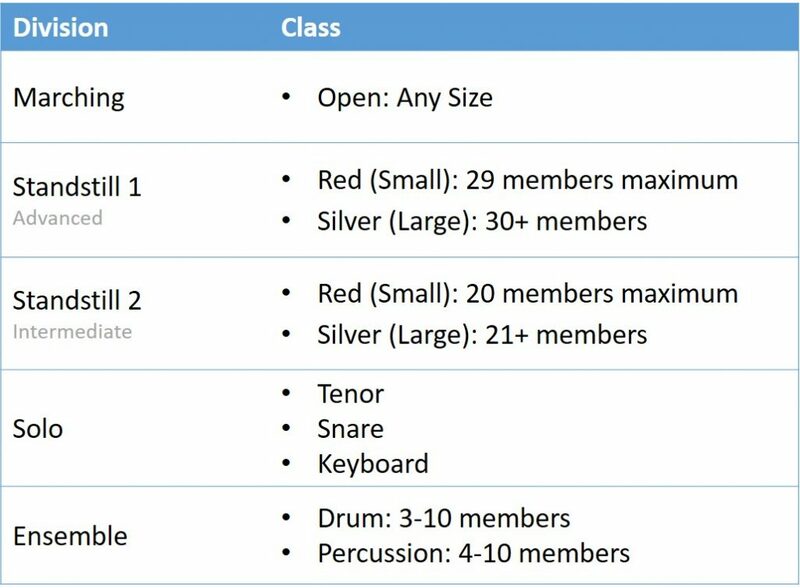 For the following Divisions and Classifications definitions and counts, “members” will refer to only “percussionists”, including all front ensemble (including keyboard/piano) and battery players. Any wind or color guard members will not be included in your drumline count for classification or judging purposes. Marching is open class and can be comprised of any number of members. Returning Champion in the Red Classification from the previous year have the option of advancing to the Silver Classification without restrictions to size at the discretion of the tournament director. Note that drumline time slot may be impacted by ensemble schedules. The Lone Star Classic employs a Preliminary/Final format for the Standstill 1-Red, Standstill 1-Silver and Marching Divisions. 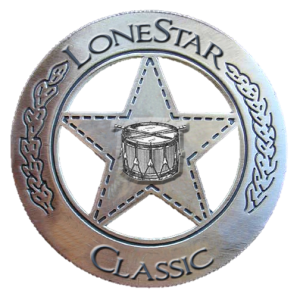 Lone Star Classic reserves the right to change the format to a “finals only” format depending on the number of drumlines registered and/or inclement weather. Please see Page 7 for possible alterations to the format. The Lone Star Classic Committee reserves the right to move the performance time to accommodate unavoidable and acceptable conflicts. Examples of acceptable conflicts are academic conflicts, SAT testing and other published UIL events. Directors are asked to be aware of these conflicts and state them on the registration. Standstill 1-Red, Standstill 1-Silver and Marching Champion shall be assigned the last performance time for their preliminary performance only. Standstill 2-Red, Standstill 2-Silver shall be assigned the last performance time in their class. A drumline director may request an earlier playing time than assigned due to conflicts or other reasons. Assignments will be made at LSC discretion. Late or wait-listed entries will be reviewed by LSC and will receive performance times available on the schedule as published. Performance time and order for FINALS PERFORMANCES shall be determined during check-in via blind draw. All Soloists will be placed in random order of postmarked entry and paid entry receipt. The Lone Star Classic Committee reserves the right to make adjustments as necessary for soloists to accommodate other contest commitments with their own school’s drumline. Entries after October 15th must contact the Lone Star Classic Chairman. The Lone Star Classic may limit the total number of entries from all Divisions. We anticipate a limit of 80 competing drumlines, 15 entries each for Tenor, Snare and Keyboard Soloists, and 5 Small Ensemble entries. A minimum of 3 entries in each of the solo and ensemble categories is required for adjudication. If this minimum is not met, then the entrant will be allowed to perform an exhibition. Any acoustic or electronic percussion is allowed. Electricity will be provided to a single outlet box. Each group is responsible to provide its own electric power cords and equipment. Accompaniment by non-percussion instrumentation is permitted. All music must be performed live. Each drumline will be allotted a maximum time on the field of 12 minutes to enter, set-up, perform, tear down and exit the contest area. The drumline will be signaled by a field official to enter the field. The start of the allotted time shall be when equipment crosses the start line onto the field. The stop time shall be when all equipment has been removed from the performance area. No performance field boundaries will be imposed. Times will be reported in the final scoring. A minimum of three and a maximum of four judges will adjudicate the field performances for Standstill Division II ensembles. During Preliminary performances, a four-judge panel will adjudicate Standstill Division I and Marching ensembles. For Finals performances, a minimum of four and a maximum of six judges will adjudicate. In the event that six judges are utilized the highest and lowest scores will be dropped. Established tie-breakers will still apply. Solo and Small Ensemble performances will be judged by a minimum of two and maximum of four judges. Each drumline will be judged in, and scores allotted to the following: Execution, Repertoire and Performance Effectiveness. Overtime penalties for drumline performances are based on the 12-minute allotment for set-up, performance and clearance from the field. Overtime/Undertime penalties for Soloists and Small Ensembles are based on minimum/maximum requirements listed below. The soloists will be announced. The judges will signal solo performers when they are ready to for the performer to begin. The soloist may choose to introduce themselves and the title and composer of their work. Snare and Tenor soloists should begin with their compulsory. The minimum performance time for solo snare and solo tenor shall be two (2) minutes. The maximum time for solo snare and solo tenor shall be four (4) minutes. The minimum performance time for solo keyboard shall be three (3) minutes. The maximum time for solo keyboard shall be seven (7) minutes. Snare Compulsory: Double Stroke Roll, Open-Close-Open, not to exceed 60 seconds holding Close not less than 10 seconds. Tenor Compulsory: Single Stroke Roll, Open-Close-Open, not to exceed 60 seconds, holding Close not less than 10 seconds. Use a single drum. The ensemble will be announced. The judges will signal performers when they are ready to for the ensemble to begin. The ensemble may choose to introduce themselves and the title and composer of their work. The minimum performance time for Drum Ensembles shall be two (2) minutes and the maximum shall be four (4) minutes. The minimum performance time for Percussion Ensembles shall be two and a half (2.5) minutes and the maximum shall be eight (8) minutes. The sum of the Judges’ scores will be divided by the number of Judges to determine the average Raw Score. Penalty deductions will be reduced from the Raw Score resulting in a Net Score. First tiebreaker will be determined by ranking the drumlines based on the average of the Execution Score. Second tiebreaker will be determined by ranking the drumlines based on the average of the Performance Effectiveness Score. Third tiebreaker will be determined by ranking the drumlines based on the average of the Repertoire Score or Compulsory Score. Fourth tiebreaker will be based on the lower amount of penalty deductions. In the event drumlines or soloists are tied after four tiebreakers, the position will be declared a draw and each drumline will share the position. Placement Awards will be given to soloists and ensembles for the top three (3) performances in each division. The Caldwell Cup, Best Percussion Performance, will be awarded to the drumline scoring the highest tabulated net score of the Preliminary performance. The Award consists of one traveling trophy and one permanent trophy. Most Creative Drumline Show – drawn from any finals drumline performance. Awards should be picked up at the event or arrangements made to pick up awards after the event with the Lone Star Chair. Lone Star may not take responsibility for delivery or shipping costs of the awards. An open area for temporary storage will be provided under your own supervision, and at the drumlines’ own risk. The Lone Star Committee assumes no risk of loss, damage or theft. Drumlines will be provided a recording of their Lone Star Classic performance. Judging sheets and comments will be made available electronically after the event conclusion. Note: Preliminary recaps will not be available until after the event conclusion. Hard copies of the Finals recap will be available after the finals awards at director check-in. Lone Star Classic recaps will be posted to the website within 24 hours of the event conclusion. Each drumline will be allotted 120 minutes on-site prior to their performance. This time includes off unloading, warm-up and movement into position. Soloists may warm-up in the designated warm-up area. Finalists will be allotted 75 minutes (or as time allows) on-site prior to their performance. This time includes off unloading, warm-up and movement into position. Due to local city ordinance, warm-up and practice on site will be allowed only in the areas designated. Play outside of this area for all Divisions and all Soloists is prohibited. Directors: please help us comply with this ordinance. Drumlines are not allowed to re-apportion their practice area. Option 1: Move the groups scheduled to perform in the stadium into an indoor facility (gymnasium). If any one of the groups in the division (SS1-R or SS1-S or Marching) are moved indoors for prelims, then the entire division will perform prelims indoors. Option 2: In the event of changing weather conditions on the field, a delay may be issued for performing groups. These announcements will be broadcast on Twitter. Option 3: Change the event to a one performance (i.e. “finals only”) event. In the event that delays or changing weather conditions preempt the full execution of the Finals Event for any division, then the scores from Preliminaries shall be used to determine Finals placement. As an example, if the first two SS1-R groups have performed and then inclement weather (sufficient in the sole judgment of the Lone Star Classic Committee Chairman) prevents other groups from performing on “an equal plane”, then the Finals Event will be stopped and the scores from Preliminaries will be used to determine the Finals Placement. Version 2019 (updated March 2019). These rules will be reviewed and updated annually. Entry deadline is October 26th (two weeks prior to event). Late entries, please email chair@lonestarclassic-dlc.com for availability. Late registration fee is $225. Entries are not considered official until paid in full. Drumlines not paid prior to November 1 may lose priority performance slots. Entries after November 1 must contact the Lone Star Classic Chairman. Overtime penalties for drumline performances are based on the 12 minute allotment for set-up, performance and clearance from the field. Overtime/Undertime penalties for Soloists and Small Ensembles are based on minimum/maximum requirements listed in section 7 below. The minimum performance time for solo snare and solo tenor shall be 2 minutes. The maximum time for solo snare and solo tenor shall be 4 minutes. The minimum performance time for solo keyboard shall be 3 minutes. The maximum time for solo keyboard shall be 7 minutes. The minimum performance time for Drum Ensembles shall be 2 minutes and the maximum shall be 4 minutes. The minimum performance time for Percussion Ensembles shall be 2.5 minutes and the maximum shall be 8 minutes. Version 2018 (updated March 2018). These rules will be reviewed and updated annually. Champions shall be assigned the last performance time in their class. In the event that a returning Champion has moved into a new division or class that drumline will be assigned the second to last performance time within that new division/class. DC Recipients shall be assigned performance times immediately prior to the returning champion(s). In the event that more than one Lone Star Classic DC Recipient is in a given class, then the order of performance will be determined first by level (Emerald or Crystal) then by the time stamp of the electronic or mail-in registration. A drumline director may request an earlier playing time than assigned due to conflicts or other reasons. On a space-available basis all electronic entries time stamped or mailed entries postmarked after the registration deadline may be added to the playing performance schedule or wait-listed. Late entrants (entries after the two-week cutoff) must contact the Lone Star Classic Chairman. Late Entries will receive performance times available on the schedule at the time of entry. All Soloists will be placed in random order of postmarked entry and paid entry receipt. The Lone Star Classic Committee reserves the right to make adjustments as necessary for soloists to accommodate other contest commitments with their school’s drumline. The Lone Star Classic may limit the total number of entries from all Divisions. We anticipate a limit of 75 competing drumlines, 15 entries each for Tenor, Snare and Keyboard Soloists, and 5 Small Ensemble entries. A minimum of 3 entries in each of the solo and ensemble categories is required for adjudication. If this minimum is not met, then the entrant will be allowed to perform an exhibition. A minimum of four and a maximum of six judges will adjudicate the field performances. In the event that six judges are utilized the highest and lowest scores will be dropped. Established tie-breakers will still apply. Overtime penalties for drumline performances are based on the 12 minute allotment for set-up, performance and clearance from the field. Any acoustic or electronic percussion is allowed. The Lone Star Classic will make reasonable efforts to provide electricity via a single outlet box, but each group needs to have their own backup plan in the event power from the venue/stadium is not available. Each group is responsible to provide its own electric power cords and equipment. The sum of the judges’ scores will be divided by the number of judges to determine the Raw Score. Tiebreaker #1: rank based on the average of the Execution Score. Tiebreaker #2: rank based on the average of the Performance Effectiveness Score. Tiebreaker #3: rank based on the average of the Repertoire Score. Tiebreaker #4: rank based on penalty deductions (lower deduction is ranked higher). In the event drumlines are tied after four tiebreakers, the position will be declared a draw and each drumline will share the position. A minimum of two and maximum of four judges will adjudicate solo & ensemble performances. Overtime/Undertime penalties for Soloists and Small Ensembles are based on minimum/maximum requirements listed below in Solo and Ensemble Competition sections. In the event of a tie the following will determine rank. Note that tiebreaker #4 and draw are common across the solo & ensemble areas. In the event the solo/ensemble are tied after four tiebreakers, the position will be declared a draw and each solo/ensemble will share the position. There will be one awards ceremony at the conclusion of all drumline performances. Placement Awards will be given to soloists and ensembles for the top three (3) performances in each class. Placement Awards will be given for the top five (5) place finishers in each class. The Caldwell Cup, Best Percussion Performance, will be awarded to the drumline scoring the highest tabulated net score of any performance. The Award consists of one traveling trophy and one permanent trophy. Most Creative Drumline Show – drawn from any performance. Judging sheets, comments and performance video will be made available electronically after the event conclusion. Each drumline will be allotted 120 minutes on-site prior to their scheduled performance time. This time includes off unloading, warm-up and movement into position. In the event of inclement weather being declared, warm-up times will be reduced. Option 1: Move the groups into an indoor facility for warm-up and performance. Warm-up times will be shortened. Option 2: In the event of changing weather conditions on the field, a delay may be issued for performing groups. These announcements will be broadcast on Remind and Twitter. Version 2017 (updated August 2017). These rules will be reviewed and updated annually. The Lone Star Classic employs a Preliminary/Final format for the Standstill 1-Red, Standstill 1-Silver and Marching Divisions. In the event that a returning Champion has moved into a new division or class (e.g. moving from Standstill 2 to Standstill 1, moving from Standstill Silver to Standstill Red) that drumline will be assigned the second last performance time within that division/class or preliminary as applicable. Standstill 2-Red, Standstill 2-Silver shall be assigned performance times immediately prior to the returning champion(s). In the event that more than one Lone Star Classic Director’s Circle is in the Preliminary or Division, then the order of performance will be determined first by level (Emerald or Crystal) then by the time stamp of the electronic or mail-in registration. Late entrants: Entries after the two-week cutoff must contact the Lone Star Classic Chairman. Drumlines will be provided a DVD of their Lone Star Classic performance. Version 2016 (updated August 2016). These rules will be reviewed and updated annually.